India vs England 5th Test Day 5 Highlights: India lost the final Test by 118 runs. India vs England 5th Test Day 5 Highlights: England beat India by 118 runs to wrap up five-Test series 4-1. Opener KL Rahul and Rishabh Pant both scored centuries to hold up England’s victory charge at the Oval on Tuesday but it was not enough to deliver the visitors a win in the final Test. At tea India were 298/5, needing 166 more runs for victory, with England requiring five wickets to seal a 4-1 series win. India lost Ajinkya Rahane and Hanuma Vihari in quick succession before lunch, giving hosts control. India's fight comes to an end as England seal the series 4-1. India lose the final Test by 118 runs. Rahul and Pant centuries helped India close on on 345 but it was not enough to deliver a win. England are one wicket away from winning the match as Ravindra Jadeja is gone for 13. OUT! Ishant reviews but he is caught-behind off Sam Curran. England need two more wickets to end the match. Mohammed Shami is now out to bat with India trying to bat out around 16 overs. Rishabh Pant departs after scoring 114. What a great knock by the Indian. Rishabh Pant is caught at long-on by Moeen Ali off Adil Rashid. India require 136 runs to win. Well, that is how he got that far..... Fabulous innings from Rishabh Pant. England get a breakthrough as KL Rahul departs for 149 after building a 200-run partnership with Rishabh Pant. Rahul departs to a standing ovation at the Oval after making the highest score by an Indian batsman in the fourth innings of a Test - only bettered by Sunil Gavaskar's 221 at The Oval in 1979. India are 325/6. Absolutely top innings from KL Rahul. And it required a monster ball to get him. The final session of the series is underway at the Oval. India require 166 runs to win. At 177, the Rahul-Pant partnership is currently the 4th highest 4th-innings stand for the 6th wicket in Tests, and India's 4th highest 4th-innings stand for any wicket. India smash the bowling to keep themselves alive as they go into tea at 298/5. This is the second Test ever to contain both four centuries and nine or more ducks (after NZ v Eng, Christchurch 2001-02). Also the third Test to feature 9 or more ducks and 9 or more 50+ scores. Rishabh Pant brings up his maiden Test century with a six! He had opened his account in Test cricket with a six to Rashid and brings up his maiden Test ton with a maximum to the same bowler too! KL Rahul and Rishabh Pant with India's highest partnership during India's tour of England. India bring up their 250. Rishabh Pant brings up his maiden Test half-century, keeping India's hopes alive. It has been a good knock from Pant so far. But maybe a pointless one for the visitors at this stage. Rishabh Pant now has the highest score by an Indian wicket-keeper in the eight Tests in South Africa and England in 2018. This is the only the fourth Test ever in which three batsmen have made 125+ in the second innings. 50 partnership between Rahul and Pant. All England need are five wickets to end the match quickly. India (292 & 182/5), need 282 runs more vs England (332 & 423/8d). Rahul and Pant keeping India steady. India vs England 5th Test Day 5 Live: LUNCH! LUNCH! India go into the Lunch break at 167/5 with KL Rahul on 108 and Rishabh Pant on 12. India need 297 runs more to win and England need five more wickets. Not going to be easy for India to save things from here but KL Rahul has shown plenty of resolve to make things difficult. Numbers game: KL Rahul joins Sunil Gavaskar and Shikhar Dhawan as the only Indian openers to score a century in the fourth innings of an away Test. CENTURY! KL Rahul with a boundary down the ground to Ben Stokes and brings up his fifth Test century. Virat Kohli and the Indian dressing room applauds the effort. Too little, too late? India vs England 5th Test Day 5 Live: FOUR! FOUR! SIX! FOUR! Rishabh Pant comes out to bat ahead of Ravindra Jadeja who had scored 86 in the first innings. 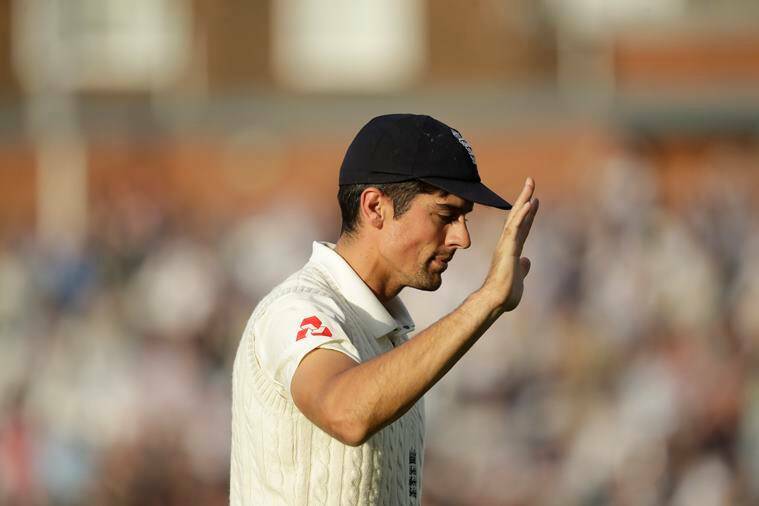 India vs England 5th Test Day 5 Live: WICKET! GONE! Hanuma Vihari with a fifty run knock in the first inning and now walks for a duck. Ben Stokes strikes and India go five down. Short delivery outside off, Vihari stays in his crease and pokes at it rather needlessly. Gets the outside edge and goes into the gloves of Bairstow. GONE! Ajinkya Rahane departs for 37 runs from 106 balls and Moeen Ali strikes. How many times has Moeen taken a key wicket this Test to disrupt a well-set pair? Does so again. Absurd shot by Rahane. Totally unnecessary. One would expect more from a player of his experience and patience. Went for the sweep shot, got way early to it and gets the toe end of the bat. Pops comfortably in Jennings' hands. India vs England 5th Test Day 5 Live: FOUR! FOUR! India's opening slot problems can be highlighted by the fact that KL Rahul's fifty is the first fifty by an Indian opener away from home in 2018. And India have played a long series against South Africa and now England. India vs England 5th Test Day 5 Live: FIFTY! Hello and Good Afternoon! Welcome to our continued live coverage of India's tour of the UK which began with games against Ireland and now it finishes at The Oval in London. Been a roller coaster of a performance at times by the Indian times and emotions that go with it. But as things stand, India would be pretty exhausted but would need to put out all stops to try and finish without a defeat. Early signs of the chase - a 464 runs at that - had India reeling under the intensity of the England seam attack. KL Rahul and Ajinkya Rahane persisted to settle nerves but they have a massive task ahead of them.